This entry was posted on November 5, 2013 at 9:11 pm and is filed under 2013 Giller Prize. You can follow any responses to this entry through the RSS 2.0 feed. You can skip to the end and leave a response. Pinging is currently not allowed. I would have to think that Alice Munro winning the Nobel Prize for her brilliant short stories would be very inspiring for everyone who is interested in the genre. That said, the very fact that we televise the Giller ceremony, and give such prominence to the 5 short listed authors is a wonderful thing, and hopefully will continue to encourage and reward our Canadian writers. Of course it would be even better is the Shadow Giller jury could pay its debts, but that is another story. Unfortunately, revenue and cash flow problems effect many in the book publishing industry, not just the Shadow Giller. Combined with Alice Munro’s Nobel win, I do think this gives the short story genre a boost in Canada — and we do publish more collections here than most English-speaking countries do. I will be interested in David’s comment if he does check in on the result. He reads more Canadian story collections than any of the Shadow Jurors do and I suspect he’ll have a number that he considered superior to this one. Then again, I think with story collections there is an even wider divergence of opinion than with traditional novels. From my own experience, if I find that I respond very positively to the first or second story it tends to set me in a much more receptive mind to the rest of the collection. With now 19 years of comparison – I wonder if you’ve noticed any patterns in the years where you’ve disagreed with the eventual ‘real’ winner? Any common judges in those years? Well, we have disagreed two out of the three times that Margaret Atwood was on the panel, but I wouldn’t draw too many conclusions from that. The first time (we picked Wayne Johnston over Alice Munro) was because we found too much “sameness” in the Munro collection and Johnston was a fresh voice. As you can tell from our votes this year, we and the Real Jury were just light years apart in our impressions. If there has been any general pattern, I would say the Shadow Jury has perhaps tended to opt more often for newer writers and been willing to overlook some of the flaws in their work. Sorry, olbrucie, I’d forgotten Atwood is a four-time juror — she was on the panel that awarded a joint prize to both Michael Ondaatje (for Anil’s Ghost) and David Adams Richards (for Mercy Among the Children). Our choice that year (it was a very small jury) was Elizabeth Hay for A Student of Weather so we have disagreed with Ms. Atwood three out of four times. Having said that, all three of those novels were pretty evenly matched. I am genuinely shocked by this decision, so much so I really don’t know what to say. I think anyone who read the books was as shocked as you and I were. Frankly, had Coady’s The Antagonist won two years ago I would have been less surprised then. It’s kind of disappointing, though. Somehow I had always thought that the Giller was for a novel, and I’ve read some lovely Giller winners over the years. This is the fourth story collection to win in the 20-year history — Munro has won twice and Vincent Lam won about seven years ago. There are usually two collections on the longlist, one moves through to the shortlist. It may be a Canadian thing, but both the other prizes also include story collections. I guess in a nation where Alice Munro and Alistair MacLeod are our writing heroes it would be near traitorous to not include them. Your blog was my first port of call when I got up this morning, Kevin (well, second actually…) and I confess I was very surprised and a bit disappointed. I’d hoped to see that the Giller had been won by either Vyleta or Davidson. I expected to see it had been won by Lisa Moore. Being a fan (if a recent convert) of the short story, I’m happy to see a collection win, even though I do slightly question how you can compare novels (apples) with short stories (oranges). 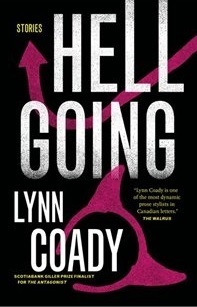 And to give ‘Hellgoing’ its due it is – for the most part – a strong collection – this year only two of the big three Canadian prizes have put a collection on their shortlists and both of them have picked ‘Hellgoing’ which must say something for its quality. The thing about short stories is I often think that, for all they are lately being marketed as ideal for today’s (supposedly) time-poor reader, actually most of their readership is made up of other writers – looking at reviews of collections on Goodreads would seem to lend some credence to this – and I do think writers read differently to those of us that just read for pleasure, hence we talk sometimes about authors as being “writers’ writers”. Coady’s stories seem to me the type of work that writers will love for their technical virtuosity and craftsmanship, and whilst I can admire some of that, none of the stories in ‘Hellgoing’ connected with me emotionally which, for me, is that added ingredient that elevates a work from ‘good’ to ‘great’, and that’s perhaps why they haven’t really lingered in my memory. And yes, there are other Canadian collections that I’ve preferred this year (certainly Armstrong’s but I also really rated Astrid Blodgett’s ‘You Haven’t Changed a Bit’ and Shaena Lambert’s ‘Oh, My Darling’) but I think that is just a matter of taste. Last year’s crop of Canadian collections was probably stronger and I was really baffled by the two that last year’s judges included in the longlist at the expense of such wonderful books as Miranda Hill’s ‘Sleeping Funny’, Daniel Griffin’s ‘Stopping for Strangers’, Buffy Cram’s ‘Radio Belly’, Heather Birrell’s ‘Mad Hope’ or Yasuko Thanh’s ‘Floating Like the Dead’. This year I don’t feel like any brilliant collections have been overlooked and ‘Hellgoing’ was certainly deserving of shortlisting; but really? The best Canadian book of 2013? I look forward to seeing what wins the Governor General’s Award – now that is a really strong shortlist. Again, my sincere thanks for such a thoughtful comment — and particularly for the recommendations at the bottom. I tend to agree that asking juries to judge short stories against novels adds some perhaps unfair complexity, but I’m still glad they get included. Frankly, the Giller longlist usually features at least one collection that I had not heard of — I confess that I don’t have a reliable early warning system in place that alerts me to what is on offer and how good it might be. Each year seems to feature a large number of debut collections (some of which turn out to be quite good) and that makes choosing even harder. I also agree that short stories get more attention from writers than readers. I don’t buy the “quick” read argument either — indeed, I have lots of time to read but establishing the discipline of making sure there is a 20-minute window each day for a short story is a challenge that I can’t seem to meet. And if I don’t stick to that kind of schedule (I know that’s the discipline you use) the stories simply don’t get read. I know your high opinion of the G-G nominees The Lion Seeker (which I have and intend to get to soon) and A Beautiful Truth — The Orenda, The Luminaries and The Hungry Ghosts would all have been on my Giller shortlist. So I too am looking forward to seeing who wins the G-G — their shortlist might be a little more “conventional” with established authors but this year I think it is stronger. I too really enjoyed and appreciated the CBC program last night. Sometimes in previous years they seemed to want to pretend that writing and reading were so unpopular that the broadcast had to concentrate on music and other distractions. This year they really focused on the books and authors — to very good effect. Having already left an enthusiastic comment about this collection on your review, I’ll just skip to saying that I was pleased to see her work recognized this year. But, yes, surprised. Definitely. Munro, sure: her wins were unsurprising given her stature. And Lam’s stories were interconnected, welcoming readers who would usually prefer a novel. But a collection of standalone stories by a mid-career writer? Unexpected. But refreshing. You make a good point — story collections, I think, tend to produce a more “individualistic” response. None of us thought Hellgoing was bad, we just did not find anything that moved it up a few notches. You obviously did and that illustrates my thought because I feel that happens more often with collections than novels. I agree also that linked story collections (which I quite like) are easier for novel readers to enrol in than ones like this one although I was not a fan of Lam’s book. And finally I should note that the Shadow Jury does owe $50,000 to a short story writer. Our 2010 winner was Alexander MacLeod’s Light Lifting and the Real Jury chose The Sentimentalists — so we aren’t biased against story collections. Hell’s bells, buddy! I’d have been giving Lynn Coady Gillers and GG’s all the way back to Strange Heaven and Play the Monster Blind. Consistently fine writing in my opinion; she’s a boon companion to Bill Gaston for getting inside the heads of losers and miscreants. And why hasn’t Gaston got his due yet, I have to ask? All I can say is that all four of the Shadow Jurors had a different point of view than you on this one — but the Real Jury obviously agreed with you.